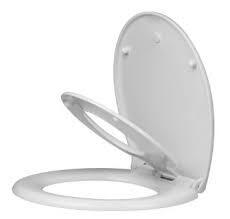 A broken toilet seat is not only unsightly and inconvenient, but can be downright dangerous to your health and safety. If it moves when you sit on it and you fall to the floor, you can do yourself a serious injury that requires a visit to the hospital. You should never stand on a toilet seat to reach anything off a shelf or to reach the tops of your walls or ceiling while painting. They're only meant for sitting on. Anything else is dangerous. We can install you a new toilet seat while you boil the kettle and break out the biscuits.